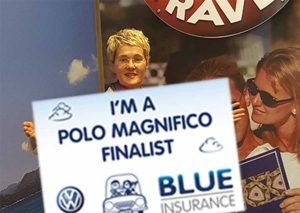 Kate McGillycuddy from Abbey Travel in Killarney is the October finalist in the competition to win a Polo Magnifico run by Blue Insurances. 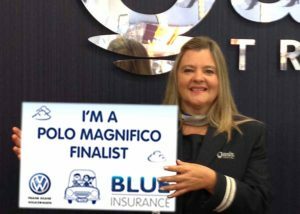 She is the second finalist from Munster and follows previous finalists Angela Taylor from Oasis Travel, Helena Kilduff from Skytours, Rose Kane from Kanes Travel in Longford, Claire Mulligan from Clubworld Travel, Mandy Walsh of Travel Counsellors and Rita Gaughan from Limerick Travel. The competition started in April and runs until March 2017. Monthly winners enter a draw for a new Volkswagen Polo in a competiton organised by Ian Dack of Ireland’s Largest Volkswagen Dealership, Frank Keane Volkswagen and Ciaran Mulligan of Blue Insurances. Every five Blue Insurances policies sold each month automatically generates an entry in the monthly draw. Blue Insurances reminds agents to have their own unique login to make bookings count for their monthly draw.Agents can win a bonus place at the final by posting humourous pictures or videos featuring themselves with a car to Facebook or Twitter with the hashtag #DontRenewUnlessItsBlue. Each of the 12 monthly winners and bonus winner, will take home an iPad Mini and be invited to the Grand Final in Dublin in April 2017 to compete for the Volkswagen Polo. See here for more information on the competition. The 12 monthly winners and bonus winner win an iPad Mini compete in the grand finale in April 2017 in Dublin. Website. Watch here interview with Ciaran Mulligan of Blue Insurances.